"I know through Gurus and Shastras (and by direct experience) that Sai is God himself : He is Bhagavan and Ishwara. I mediate on this form in my heart with all my mental faculties. He is the embodiment of truth, divinity, universal consciousness and one who pervades all the words. I pray to such Saiparameshwar to direct our intellects to engage in auspicious and righteous activities. I meditate on this great form"
This Sathya Sau Gaayathri, like other Gaayahtris, is on a part with Veda Manthra or mystic formula. It has 24 letters; it consists of three lines, each with 8 letters. Such a composition has unique properties. According to Maharishi Vararuchi, the numerology of all letters adds upto 108. That is why recitation is to be done 108 times, to realize the full effect of Siddhi – which is signified by the 108th number, i.e. Meru or the tassel of a rosary or Japamala. Ashtottara Shata Naama – the 108 name chanting leads to realization of God, which is the goal. Every Gaayathri Manthra has a revealing prophet or Rishi and a presiding diety Adhishthana Devatha, who is the subject of manthra. 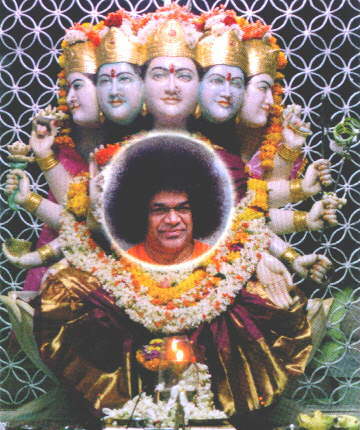 This manthra is expressed through the inner workings of Sathya Sai through the mouth of Pandit Sri Ghandikota Subramanya Shastry in the presence of Sri Sathya Sai Baba. Needless to say that Sai Baba himself is the presiding deity of this mystic formula or Manthra.